We’re living in a golden age of Alexander Technique information availability: websites, articles, blogs, audio and video resources. The amount of good information available in all these media is huge, and growing daily. Now I’m a pretty linear kind of guy and so I don’t gravitate naturally to these sorts of depictions. But there are lots and lots of people who do. And there are Alexander Technique teachers and students who are very skilled at creating them. Pinterest creates these Boards automatically as you add new material and it’s becoming an increasingly popular social media platform. I had the image at the top of Jupiter’s blog modified for one of the pages of my website and I posted it on Facebook awhile ago, where it got a lot of attention. You can see it on the left. It’s now on several Alexander Technique sites around the world. This kind of “quote on a background” always gets a very good response on Facebook and Twitter. If you “like” my Facebook page, you can see dozens of examples produced by me and others. They are very easy to create. If you are drawn to any of the versions of a “word-image” style of presentation, please consider creating (or having Claire create) your own Graphic Recording, or a Pinterest page, or a “quote on a background” or some other visual depiction of the Alexander Technique, and then posting it on your website as well as on Facebook, Twitter and other social media sites. After all there can never be too many ways for people to learn about the Alexander Technique. Robert, thank you so much for featuring my drawing on your blog – I was thrilled to be commissioned to do this and I loved learning about Alexander Technique from Angela Bradshaw, who is a really talented AT teacher here in Surrey, England. We all respond to information differently and I have found that simple drawings such as this do prompt discussion, get people thinking and can go a long way to promote really powerful ideas and messages. You’re most welcome Claire. I hope other AT teachers use your service. 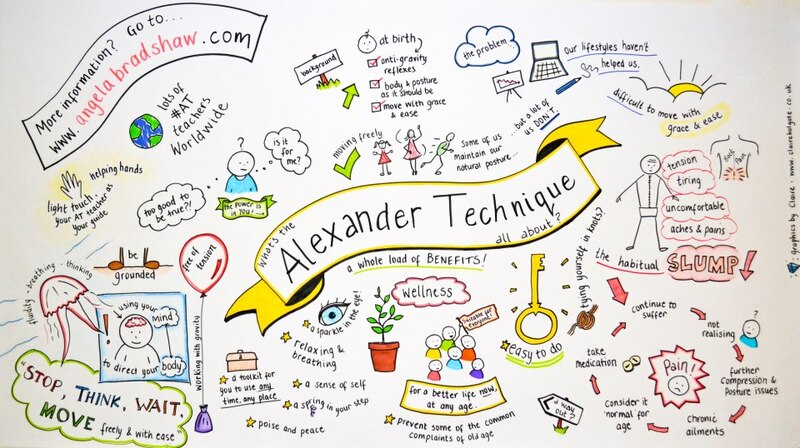 Thanks for writing about visual imagery in Alexander Technique–it’s really been helpful for me and I appreciate your sharing of my Pinterest Board, as well as the graphic recording by Claire Holgate. I’d love to see an RSA Animate video for Alexander! You’re most welcome Margaret. I’d love to see one as well.